. : Introduction & Access :. 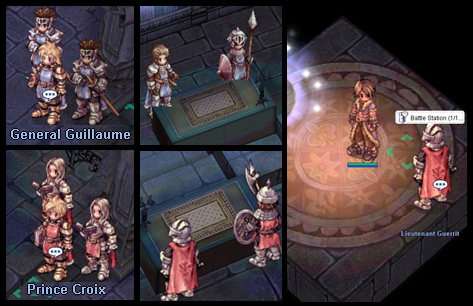 The Ragnarok Online Battleground is a system made for players to compete as a team outside of War of Emperium. The battles came in three modes: Tierra Gorge (often referred to as Tierra), Flavius, and Kreiger Von Midgard (KvM). 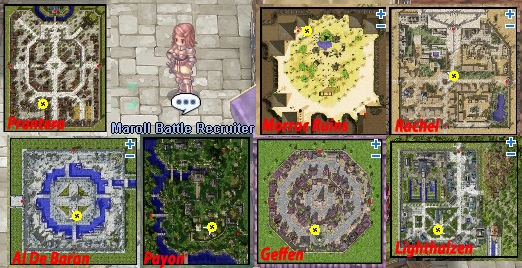 The three modes are played in different maps that are made to serve the different battle goals. To participate in Tierra Gorge and Flavius, a player must be at level 80 or higher. For KvM, players are sent to the appropriate battle waiting rooms according to their levels. After each battle, participants are rewarded with badges or reward points that can be accumulated to trade for equipment and consumable items. These are exclusive items that are only obtainable through participation in Battleground. The usage of Battlegrounds is pretty simple and straight forward. To skip to the reward list Click here. The story behind Battlegrounds is that the two princes of Maroll Kingdom are competing for the throne of Maroll. All they need are soldiers like you to help them fight. Teleporter - He will warp you back to the town where you came from. Kafra Staff - She will serve the usual Kafra functions available on your server. Erundek - He will exchange your Bravery Badge and Valor Badge (obtained from participating in Tierra and Flavius Battlegrounds) for items. KVM Logistic Officer - He will keep track of your KvM Points received from participating in the KvM Battleground. You can also use the KvM points to exchange items from him. Repairman - He is there to repair your broken equipment. He is just to the left and a little down south from the center. To sign up for a battle, first you will have to pick a side to support. Talk to General Guillaume near the north side or Prince Croix near the south side. After that, you can sign up at the counter for the side you've chosen to support. You choose between the three Battleground modes by talking to their respective officers. 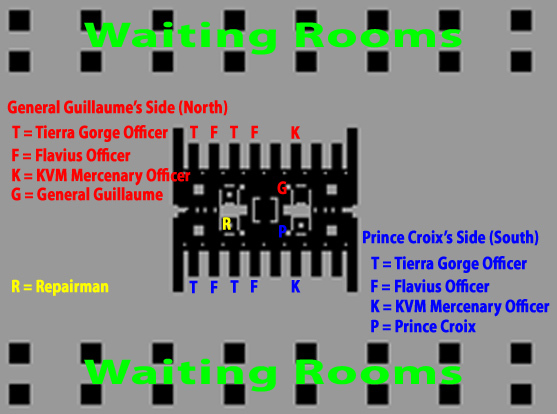 The two Tierra Gorge Officers and two Flavius Officers on either end of the lobby represent the two battlefields for each mode. They will send you to the battle waiting rooms where you will wait for other players to fill the teams. Once this process is completed, you will be warped to the battlefield. The other KVM Mercenary Officers will send you to the KvM battle waiting room that is appropriate for your base level. 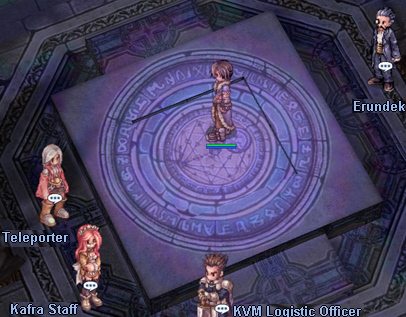 When there are enough players, you will be warped to the KvM battle map. Still not clear? Impossible. Go ahead and check the image on the right-hand side for a detailed look of the Battleground lobby setup.
.: Modes, Rules and Maps :. The goal of the Tierra Gorge Battleground is to destroy the Food Storage or Food Depot of the opposing team. 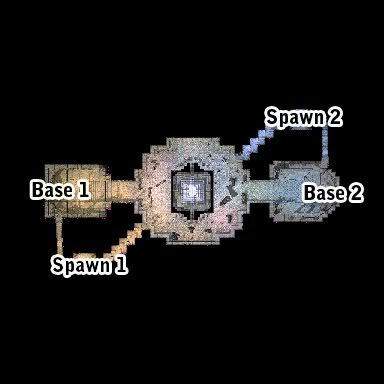 If you spawn in point Spawn 1 you attack Base 2; if you spawn in Spawn 2 you attack Base 1. Of course defending your own base is part of the battle. Player must be level 80 or higher to participate. 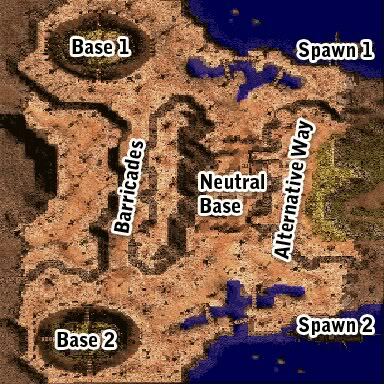 Skill restrictions and limitations for this Battleground map are the same as those for War of Emperium. The shortest path between the two bases are blocked by destroyable Barricades. If your side of the Barricades is destroyed, they can be repaired by bringing 50 Stones to Guillaume Blacksmith or Croix Blacksmith (depend on which team you've joined.). He will appear near the destroyed Barricade area when repair work is needed. The Alternative Way outlined is an unblocked path. The Neutral Base hosts a Neutrality Flag. The team that captures (kills) the flag will be spawned near the Neutral Base and earns the aid of 3 Guardians in the battle. (2 Sword Guardians and 1 of Archer Guardian). When a player dies in battle, there is a 25 seconds delay for the player to respawn fully healed. Each player of the winning team will receive 3 Bravery Badge while players on the losing team receive 1. The goal of the Flavius Battleground is to destroy the Crystal of the opposing team. A Pink Crystal and a Blue Crystal will spawn at either end of the map at Base 1 and Base 2. In order to destroy the Crystal, a team must first defeat the two Guardians of the opposing team. The Crystal is immune to any form of attack while the Guardians are alive. A team gets one point by destroy the opposing team's Crystal. The first team to get two points will be the winner. This means that Flavius can be played up to 3 rounds. Each player of the winning team will receive 9 Valor Badge while players on the losing team receive 3. The Kreiger Von Midgard (KvM) Battleground is similar to a Guild vs Guild match. 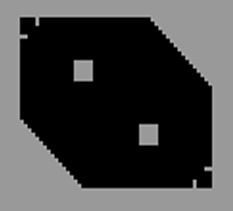 Players of the two teams are spawned in the battle arena and the first team to eliminate every player on the opposing team wins the battle. Participating players are put into teams according to their base levels. There are different battlefields for players with base level 1-59, 60-79 and 80-99 (or higher). The default amount of players required for each KvM battle is 10 to form 2 teams of 5 vs 5. This may vary on private servers. When a player dies in battle, the player must wait until the end of the match to collect reward points. The maximum time for a KvM battle is 5 minutes. When the time is up, the team with the most survivors wins. Each player of the winning team will receive 1 KvM Point in the 1-59 Base Level Group, 2 KvM point in the 60-79 Base Level Group and 5 KvM Point in the 80 or higher Base Level Group. Each player of the losing team in the 60-79 Base Level Group and the 80 or higher Base Level Group will receive 1 KvM point. The losing team in the 1-59 Base Level Group will not get any points. Note 1: After each battle, players still connected will be warped to collect rewards. Players must talk to a reward NPC to claim badges or points within the time limit given. If a player fails to claim the reward at the given time, there is no way to claim the reward after leaving the battlefield. Note 2: If there is a tie in any match, both teams will be rewarded with the losing team's reward. Warning: Battleground reward items are Character Bound. They cannot be dropped, traded, placed in cart or placed in guild storage.